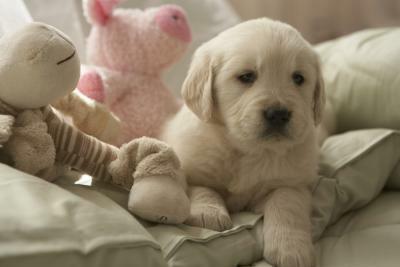 What is the Gestation Duration for Dogs? Canine pregnancies usually fall somewhere between 60 and 64 days in length, according to the University of Missouri. Expect a dog to carry her puppies around inside of her for approximately nine weeks. Not all canine pregnancies are exactly the same, though, and some dogs deliver at earlier than 60 days, while others deliver after 64. Wasn’t I worth the wait? I recently heard it was 60 – 64 counting from the day of ovulation not mating. My females have always been early. Sasha was at 58 – almost 59 days this time. The pups just a bit “under done” but have done extremely well and are thriving. The referenced post does count from the day of ovulation (I always thought it was from mating). Sasha did a wonderful job. The puppies are just perfect. I’m sharing the post with my readers because you can never have enough puppy pictures!